Hip No. 926, a bay colt by City Zip consigned by Stephens Thoroughbreds LLC, Agent, went to Frank Fletcher Racing Operations for a sale record $800,000 to top the fourth and final session of the Ocala Breeders’ Sales Company’s 2016 June Sale of Two-Year-Olds and Horses of Racing Age. Out of graded stakes placed Successful Sarah, by Successful Appeal, his quarter in :21 1/5 was co-fastest at the distance at Thursday’s Under Tack session. 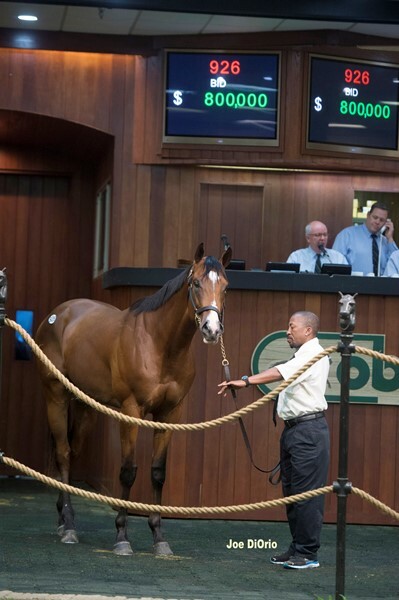 The price surpassed the previous mark of $680,000 set last year for a colt by Candy Ride (ARG). Christina R. Jelm, Agent, paid $375,000 for Hip No. 936, a son of Distorted Humor consigned by Eddie Woods, Agent. The bay colt, a half brother to Kentucky Derby (G1) winner Super Saver out of Supercharger, by A.P. Indy, turned in an Under Tack eighth in :10 2/5. Hip No. 1109, a son of Fastnet Rock consigned by Tom McCrocklin, Agent, was sold to Jerry & Ronald Frankel for $360,000. The bay colt, who worked an Under Tack quarter in :21 flat, is out of Alone (IRE), by Galileo, a full sister to grade one stakes winner Lush Lashes. Hip No. 940, a son of Uncle Mo consigned by Thoroughbred Champions Training Center LLC, was sold to Breeze Easy LLC for $240,000. The bay colt, out of Surrender, by Stormy Atlantic, a daughter of stakes placed Beaucette, breezed a quarter in :21 1/5 on Thursday. Mr. & Mrs. J. S. Moss paid $230,000 for Hip No. 1133, a dark bay or brown colt by Harlan’s Holiday consigned by McKathan Bros., Agent. Out of Anna Sun, by Trippi, a full sister to stakes winner Dark Thunder, he worked a quarter in :21 1/5 at the Under Tack Show. St. Elias Stable & West Point Thoroughbreds, Inc. went to $200,000 for Hip No. 952, a son of Aikenite whose eighth in :10 flat was co fastest at the distance on Thursday. The dark bay or brown colt, consigned by Crupi’s New Castle Farm, Agent, is out of Switcheroo, by Exchange Rate, a half sister to graded stakes winner I Spent It. For the session, 145 youngsters sold for a total of $5,237,000, compared with 131 two-year-olds grossing $5,417,100 at the corresponding session last year. The average price was $36,117, compared with $41.352 a year ago while the median price was $13,000 compared with $15,000 in 2015. The buyback percentage was 26%; it was 26.8% in 2015. Five horses sold for $200,000 or more compared with three a year ago. Sixteen Horses of Racing Age grossed $146,500, compared to 13 bringing $568,000 a year ago. The average was $9,156 compared to $43,692 in 2015 while the median was $4,250; it was $12,000 a year ago. The buyback percentage was 15.8% against 38.1% last year. For the entire sale, 621 two-year-olds sold for $18,427,900 compared with last year’s sale record $23,608,500. The average was $29,675 compared with 2015’s sale record $39,612, while the median price was $13,000 compared with $18,000 a year ago. The buyback percentage was 24%; it was 24.8% a year ago. Next on the OBS agenda is the Selected Sale of Yearlings set for August 23rd, followed by the Open Sale of Yearlings on August 24th – 25th.